"A Keyblade that lands fewer critical hits, but compensates with a boost in Magic and more frequent Reality Shifts." 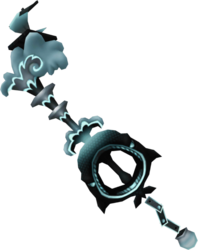 Ocean's Rage is a Keychain for Riku's Keyblade that appears in Kingdom Hearts 3D: Dream Drop Distance. 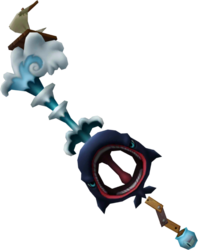 The Ocean's Rage Keyblade is mainly designed after elements of Monstro. Its blade is mainly waves of water, its teeth is the raft that Pinocchio was on, and the guard is Monstro, although his mouth is a hole and the hilt is the uvula in his mouth, although stretched to connect altogether. The keychain is mainly made up of planks of wood and the token is Cleo's fish bowl.